Exiting the building bloodied from the waist down, this hardened warrior would have a firm grip on his pistol in one hand while being carried out by two Marines. But if you ask any Marine, the one thing they praise about this picture as much as any other is the First Sergeant’s remarkable trigger discipline. For they are taught early on that you keep your finger straight and off the trigger until you are ready to fire. And for Kasal, being shot by seven 7.62 rounds and having over 40 pieces of hot fragmentation in him from grenades was no reason to break that rule. In early 2004, the Iraqi city of Fallujah was quickly becoming a hotbed for anti-American sentiment. While initially believed to be a pacified city, the March 2004 killings of private military contractors who subsequently had their bodies burned and hung over the river Euphrates proved otherwise. While there was some debate over whether to conduct surgical strikes or a full-scale military assault, in the end, the military went in hard. However, after pressure from the Iraqi government, security for the city was eventually turned over to Iraqi forces and the Americans withdrew major components. Eventually, those Iraqi forces dissolved then turned their American weapons over to the insurgents and set the stage for Operation Phantom Fury later that year. With the insurgents in possession of extra weapons, they began to build complex defensive networks and dig in throughout the city of Fallujah. As the coming battle approached, it is estimated that nearly 75% to 90% of the civilian population fled making the city an all-out and open war zone. A force predominately filled by United States Marines would amass outside the town in preparation to take the city by force. Some estimates have the insurgent forces totaling between 2,000 to 3,000, but exact numbers were never confirmed and considering the influx of foreign fighters it could have been much more. However, in the crucible of urban warfare, such a number in a defensive position can make the task quite difficult and deadly even against overwhelming odds. The Marines would have to go street by street, block by block, and endure some of the heaviest fighting in urban terrain since Hue City in Vietnam. But as long as men like First Sergeant Kasal filled the ranks of the Marine Corps, no one expected the outcome to be anything less than victorious. 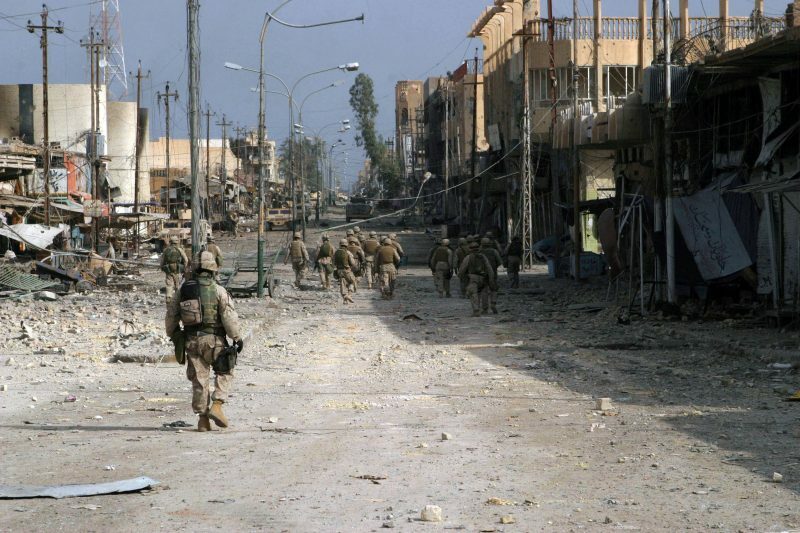 The attack began on November 7th, 2004 as coalition forces poured into the city with the support of massive air power. As the Marines pushed through the city, they encountered a prepared defense and danger at every street corner. However, it was on November 13th after a week of fighting that First Sergeant Kasal would walk into the Fallujah House of Hell and be carried out as an iconic image of the entire Iraq war. 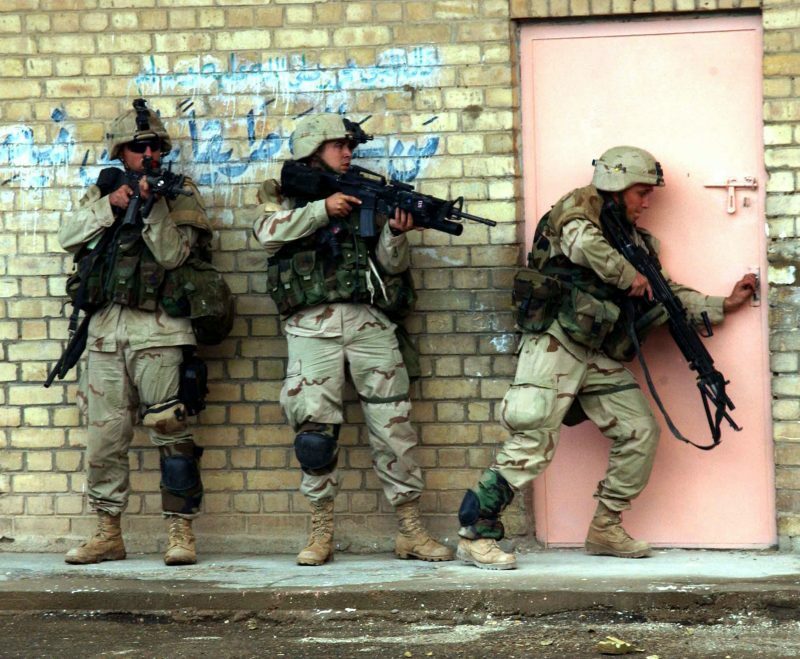 One that day, two Marines would kick in a door to one of the many houses in that city and find an insurgent hiding behind a bedroom door. The Marines dealt with that insurgent as Marines often do when the firefight alerted two other insurgents on the roof and one in the stairwell to the fact that Marines were in the building. Two insurgents fired into the house from a skylight and dropped grenades wounding a Marine. As the reinforcement Marines come in, a few more Marines were hurt and in one minute, this one house would become one of the bloodiest houses of the battle. Soldiers from 1st Platoon, Apache Troop, 2-5 Cav, 2nd BCT, 1st Cav Div move tactically as they enter and clear their objective during combat operation in Fallujah on the 9th of Nov 2004 during Operation Iraqi Freedom. That is when First Sergeant Bradley Kasal heard the gunfire and rushed into action. Upon learning that wounded Marines were trapped in the house, he grabbed another Marine in support and charged into the house. Kicking in one door, he found an insurgent with an Ak-47, who hesitated but for a second. That was enough time for Kasal to put a few rounds into his chest at point-blank range and move forward. The gunfire alerted the insurgents to a new incursion of Marines, and they sprayed Kasal and his fellow Marine with Ak-47 gunfire. With both Marines severely wounded, the insurgents dropped grenades to finish them off. Kasal, already seriously wounded, threw his body on top of the junior wounded Marine and absorbed the blunt of the blast. Believing to be mortally wounded, First Sergeant Kasal drew his pistol and prepared to defend against anyone coming to finish him or his fellow Marine off in the battle. Thankfully, Marines take care of Marines, and additional forces were rushing to their aid. However, in what would be an over hour long battle, 10 Marines were critically wounded and one dead from this one house. Two Marines would carry First Sergeant Kasal out of that house as a photographer captured the moment for posterity. 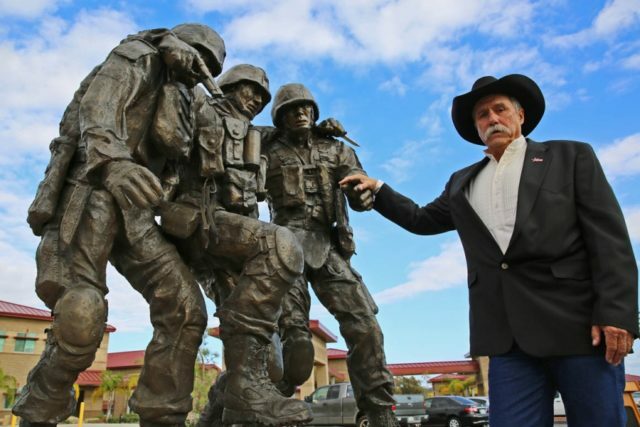 John Phelps poses with his creation after an unveiling ceremony Nov. 12, 2014, at the Wounded Warrior Battalion, Camp Pendleton, Calif. The sculpture is based on the Operation Phantom Fury photograph ‘Hell House’ of then 1st Sgt. Bradley Kasal being carried out of a house by two lance corporals after a firefight where Kasal sustained life-threatening injuries. For his actions that day, First Sergeant Kasal would be awarded the Navy Cross and eventually be promoted to Sergeant Major. And while you would have a hard time convincing now Sergeant Major Kasal that he is a hero, he would confess that he is but a representative of the Marines who fought so gallantly in the second battle of Fallujah. 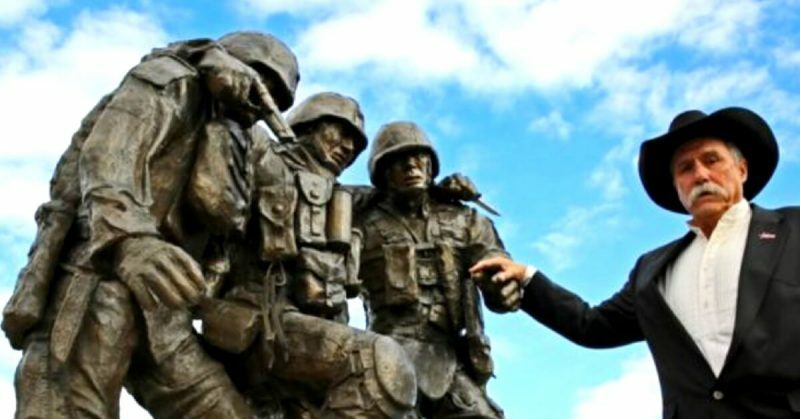 The picture of First Sergeant Kasal would go on to become an iconic image of the war in Iraq and an actual memorial and war statue. The Marines would kill those who wounded Kasal and his Marines, and they would go on to clear the entire city of Fallujah. Most fighting ended by mid-November, but pockets of resistance would continue into December of 2004. But for Sergeant Major Bradley Kasal a long and painful recovery process would await him. However, he did it for his fellow Marines and had become an inspiration for the next generation of Marines ready to get into the fight who when all looks grim, will look out for the Marine next to him. Marine Sergeant Maj. Bradley A. Kasal, right, receives congratulations after his promotion from first sergeant to sergeant major during a ceremony at Marine Corps Base Camp Pendleton, Calif., May 1. The Afton, Iowa, native received the Navy Cross, promoted and reenlisted during the ceremony. For extraordinary heroism while serving as First Sergeant, Weapons Company, 3d Battalion, 1st Marine Regiment, Regimental Combat Team 1, 1st Marine Division, I Marine Expeditionary Force, U.S. Marine Corps Forces Central Command in support of Operation IRAQI FREEDOM on 13 November 2004. First Sergeant Kasal was assisting 1st Section, Combined Anti-Armor Platoon as they provided a traveling over watch for 3d Platoon when he heard a large volume of fire erupt to his immediate front, shortly followed by Marines rapidly exiting a structure. When First Sergeant Kasal learned that Marines were pinned down inside the house by an unknown number of enemy personnel, he joined a squad making entry to clear the structure and rescue the Marines inside. He made entry into the first room, immediately encountering and eliminating an enemy insurgent, as he spotted a wounded Marine in the next room. While moving towards the wounded Marine, First Sergeant Kasal and another Marine came under heavy rifle fire from an elevated enemy firing position and were both severely wounded in the legs, immobilizing them. 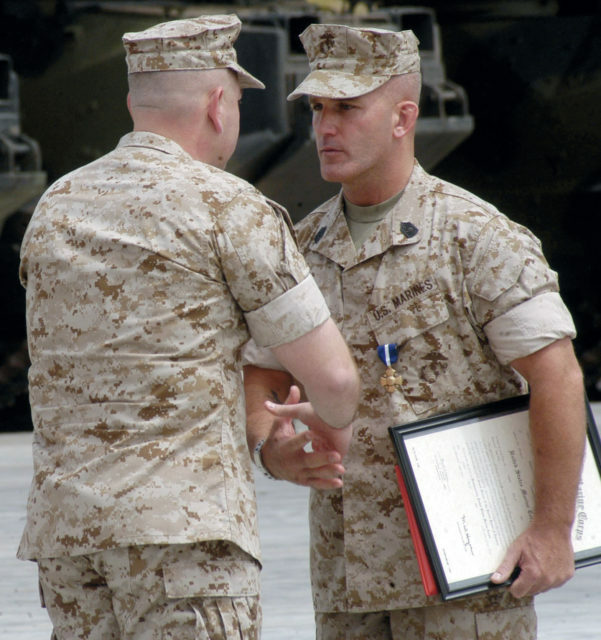 When insurgents threw grenades in an attempt to eliminate the wounded Marines, he rolled on top of his fellow Marine and absorbed the shrapnel with his own body. When First Sergeant Kasal was offered medical attention and extraction, he refused until the other Marines were given medical attention. Although severely wounded himself, he shouted encouragement to his fellow Marines as they continued to clear the structure. By his bold leadership, wise judgment, and complete dedication to duty, First Sergeant Kasal reflected great credit upon himself and upheld the highest traditions of the Marine Corps and the United States Naval Service.